I love carbs. Yeah, I’m sure you do too, but really… I LOVE carbs > like pizza and pasta and BREAD. All of that stuff is just crazy good, and I wish I could eat it all the time without any dire consequences. But carbs love me back. They love my hips, they love my thighs and they love my body in general. So, for that, I hate carbs! Once in a while I make a half-hearted attempt to avoid them. And breakfast is the easiest time to do that because although I love pancakes and waffles and Lucky Charms, I do really love to eat eggs for breakfast too. Thank goodness there is a carb-alternative that pleases me so much! 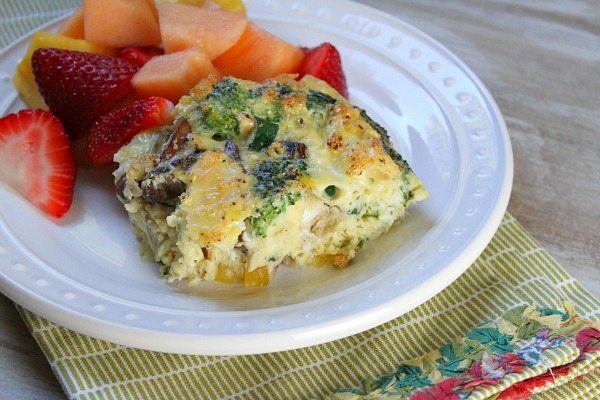 I decided to go vegetable-heavy with this egg-bake recipe and used my favorites > broccoli, zucchini, mushroom, onion and yellow bell peppers. You can use whatever vegetables you like. You’ll need to saute them in a little butter or oil before you add them to your casserole dish so they’re not so raw and crisp in the finished casserole. Next comes THE CHEESE. I used brie, since it’s generally my favorite kind of cheese and it melts into the casserole beautifully. If you’re not into brie, use something else that you like- I’d recommend Harvati, shredded Swiss or a decent tasting Monterey Jack cheese… anything that melts fairly well and that would pair well with your chosen vegetables. For this recipe, I used 10 eggs plus 6 egg whites. I added in milk (you can use WINE instead of milk to add some delicious flavor) and Dijon mustard. That egg mixture just gets poured all over the top. 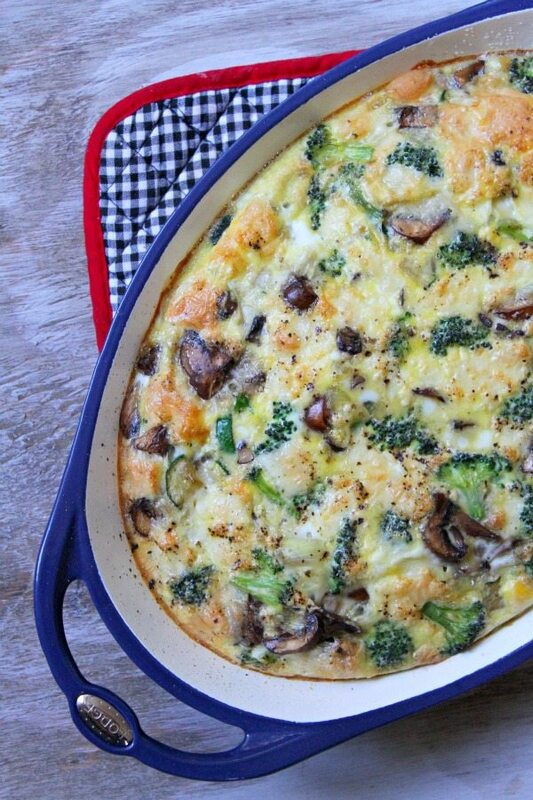 Bake until the eggs are fully cooked through. Slice and serve! It’s a good one to serve if you have a few people to feed for breakfast (and especially if you have someone visiting who is gluten-free), and I must say that it makes for a lovely dinner too. 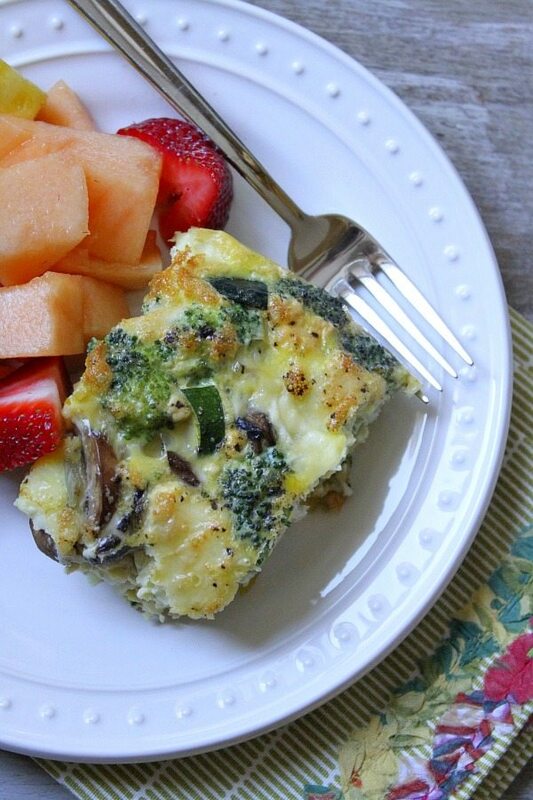 Use low fat cheeses and more egg whites in place of some of the eggs to make it lighter. We loved this recipe as written though. Enjoy! Preheat the oven to 350 degrees F. Spray a 2-quart casserole dish with nonstick spray. 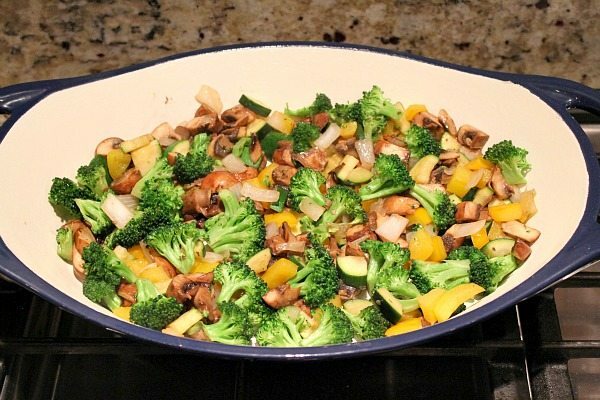 Heat a large skillet to medium, add butter or olive oil and saute the vegetables until somewhat softened. 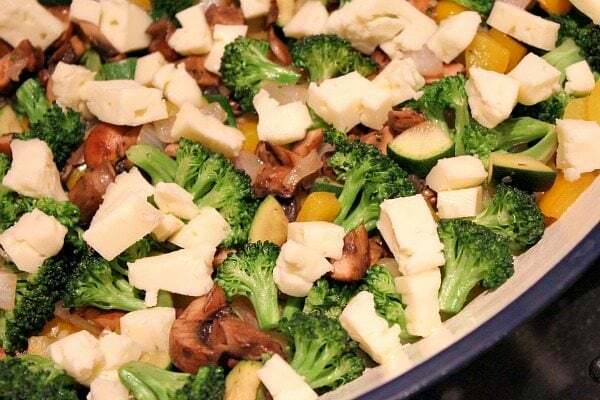 Sprinkle the sauteed veggies onto the bottom of the casserole dish. Sprinkle the brie evenly over the top. 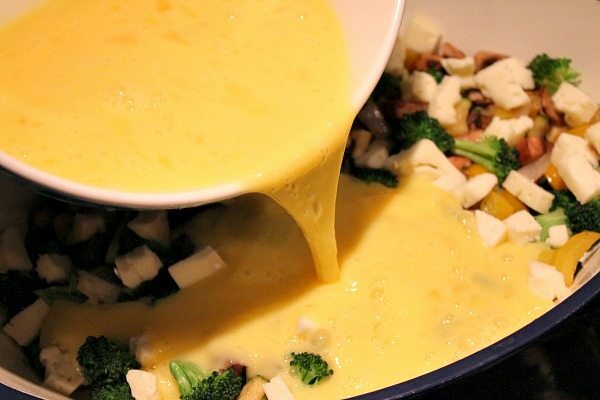 In a medium bowl, whisk together eggs, milk (or wine) and Dijon mustard. Pour over the vegetables in the dish. Sprinkle with salt and pepper. Bake 45 to 55 minutes, or until the egg is cooked through. To check, use a knife to poke into the center. If you're seeing liquid, it needs more time in the oven. Slice and serve immediately. I like to purchase the egg whites in the carton. They are easiest to measure, and you won't end up with a bunch of yolks and have to figure out what to do with them. Use remaining egg whites in the carton for scrambled eggs! If you are preparing this recipe as GLUTEN-FREE, just be sure to use a brand of Dijon mustard that is known to be GF. 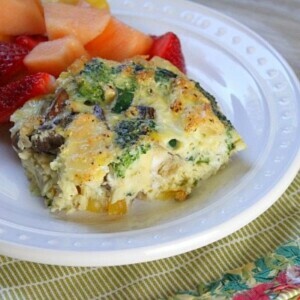 4 WEIGHT WATCHERS Freestyle SmartPoints per serving (based on 8 servings). If you cut it into 6 servings, it will be 6 points.